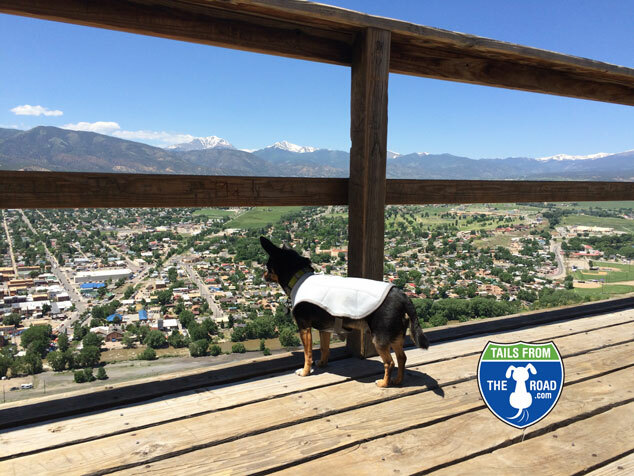 I bought Romeo a Swamp Cooler vest last year and we had the first opportunity to wear it while visiting Salida recently. We went on a hike mid-morning and the day was heating up with no shade on our route. So I soaked the Swamp Cooler vest in water and wrung it out as suggested by Ruffwear. I had it in my backpack until I felt Romeo needed it. It felt a bit heavy (because of the water) for a little dog, but Romeo adapted very quickly. He had gotten hot and was panting, I put the jacket on and in about 5 minutes he seemed much more comfortable and was barely panting. It was a hot, dry day and the jacket stayed wet/damp for about 2 hours. 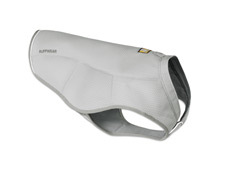 The vest is designed to reflect heat from the sun as well as provide evaporative cooling to exchange the dog’s heat as water evaporates from the vest’s reservoir. Swamp Cooler Vest up close. The jacket fit very well as most Ruffwear items do. The coverage is just right, easy for the dog to move in. I am thankful that they made one for a 9lb dog. Romeo wears an XXS. Sizes go to a XL which will fit a very large dog. All in all I would give this jacket 5 stars. While I don’t like to take my dogs out in hot weather very often, sometimes the summer heat catches up with you and it’s nice to have a good tool to cool your dog down.